The phenomenon known as the selfie can be found all around the world and these images are shared widely on social media with cute captions. Selfie sticks have since risen to prominence to extend the virtual reach of the arm. This allows for a wider background field in snapshots, while allowing more people and subjects to get into frame. These accessories are practical, popular, and in some cases, controversial for a number of reasons. A growing number of public destinations and venues have recently banned selfie sticks. The most common explanations relate to safety and visitor enjoyment. The safety question is simple to understand. Think about a sizable crowd walking around with sticks and you will realize that a potential safety problem exists in that situation. Consider people stuffing sticks in their backpacks, swinging around metal sticks at eye level, dropping sticks along public walkways, attaching large, relatively heavy, glass-surfaced phones to their ends, and not paying attention to their surroundings. In large public amusement parks, there have been cases where people have tried to use these sticks on active rides. The 'optics' of a group of people walking around with selfie sticks is another issue. People can easily walk around with sticks held high, obstructing views of otherwise picturesque places and concert performances. They can wreck the view of an otherwise picture-worthy moment with the eerie glow of a hundred LCD screens. Due these significant concerns, several public places have since instituted the banning of selfie stick. If you are one of those people who have to have the ultimate selfie (and you want one in a public place), you may want to know about where you won't be able to use your selfie stick. That way, you don't have to hike back to your car, give up your selfie stick, or get caught in a situation where you've broken some rules in public. Many arenas and stadiums across the country forbid the use of selfie sticks during the various shows and concerts. This also includes larger music festivals like Coachella and Lollapalooza. Official government buildings often have restrictions against the use of selfie sticks. Important examples include the White House and the United States Capitol in Washington, DC. Whether you are a fan of soccer, football, baseball or hockey, there is a good chance that you will not be allowed to use a selfie stick at the next game you attend. Wimbledon implemented a ban at its tennis championship starting in 2015. Major tourist attractions around the globe have begun to disallow or discourage the use of selfie sticks among visitors. Notable examples include the Colosseum in Rome and the Palace of Versailles in France. In order to protect art from an errantly destructive stick, protect paintings from the lights of flash photography, and preserve the visibility of art for visitors, many museums, like the Smithsonian and the Art Institute of Chicago, have also banned them. With children running around and thrill rides aplenty, theme parks are havens of fun. However, these very crowded areas can become remarkably dangerous with several hundred selfie sticks being bandied about. Disney has therefore banned them from all of its parks. A similar policy can be found at Six Flags and other amusement parks. Looking forward to your next trip to Seoul? Leave the selfie stick at home, because the picture-taking accessory is banned in the entirety of South Korea. As you prepare for a day of selfie stick fun, you might want to be extra sure it will be allowed. A great site to check whether selfie sticks are allowed is canibringmyselfiestick.com. 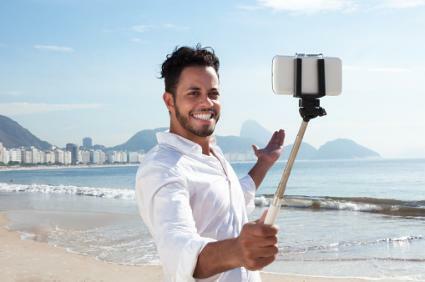 You can also do a quick Google search for your destination name and the words "selfie stick." Fans of the selfie stick can do their due diligence to ensure a carefree day of picture-taking fun.